Beautiful solo dress for sale. 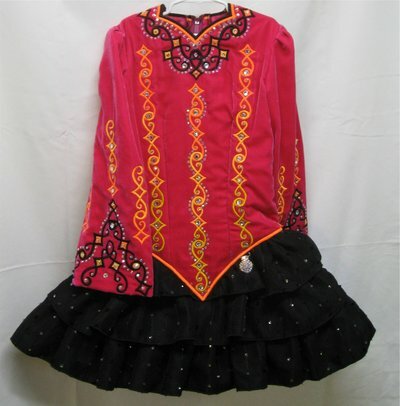 Made by Darlene Stump in June 2010, this dress is very much in style and in excellent condition. Comes with headband, 2 capes and kick pants. Additional crystals added to 2 outside rows of embroidery on bodice – this dress really sparkles on stage! Underskirt is black with pink polka dots. The dress has a full top to bottom zipper which allows for easy dressing. Asking Price: $US950. Shipping costs not included. Sale is final.